Perhaps a Pope coming from the ends of the world was needed to put an end to the so-called “Italian exception”. Id est, that privileged relationship between Italy and the Holy See that tightly linked the two banks of the Tiber. The relation was tight because of geography: Rome is in Italy, and Popes were always Italian up until 1978. This very tight relationship, which also included dangerous liaisons, gave rise to a particular web of interests. And webs die hard. Pope Francis is beyond that mentality and that kind of webs. Instinctive, spontaneous (he told journalists on the way back from the Holy Land that «the best gestures are those that come out from spontaneity»); Pope Francis wants an “Outward-Looking Church”, and barely cares about what had been there before, because – he writes in the “Evangelii Gaudium” – «one cannot hide behind ‘it has always been done this way’». 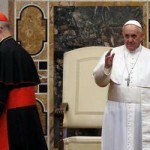 The Pope admitted not to have any specific plan for the Church and he is now applying to the Church the one and only objective that he always deemed pivotal, dating back to the time he was a provincial of the Jesuits: that the Church be missionary, and for her to earn a clean image that can make her mission appealing. The Pope’s work is difficult within a Roman Curia that has always resisted new outlooks. The Holy See has always been conscious that the relationship with Italy could have more shadows than lights. When the Holy See and Italy finally signed the Conciliation in 1929, the Holy See decided not to accept any ambassador to the Holy See who at the same time was an ambassador accredited to Italy (and resident in Italy). This was a result of the memories of the First World War: the moment when Italy declared war to Germany, the German ambassador to Italy naturally left, and the Holy See remained without a diplomatic link to Germany. The progressive internationalization of the Roman Curia was started by a Pope who had been serving as a diplomat and was very conscious of the importance of the Church’s sovereignty. Pius XII had been Papal nuncio to Germany, where he was able to carry out and sign a concordat with the Nazi country (as such agreements are meant to be reached with people you do not trust, rather than friends). As a Pope, he progressively increased the number of non-Italian cardinals. In the last years of his pontificate, tired, already old and knowing that he could not govern with the proper strength, Pius XII froze Vatican hiring, leaving everything in his successor’s hands. His successor was John XXIII, another former nuncio, who had lived his glory days in Bulgaria and Turkey before being appointed Papal nuncio to France during the years of the Second World War. John XXIII experienced in the East the richness of the ecumenical dialogue and in Europe the ferment of the Catholic movements that, since the beginning of the 20th century, were spreading to politics, society and even industries, seeking a renewal of the Christian experience that he promoted with the Second Vatican Council. John XXIII finally opened the Church to the world, and positioned it in the international context not only as a moral authority, but also as a ‘super partes’ State able to promote peace negotiations. After him, Paul VI was elected. He had been the spiritual assistant for the University Federation of Italian Catholics (FUCI) and thus personally knew all the Italian Catholic men in politics. Like Pius XII, Paul VI paid close attention to what was happening in Italy. Like Pius XII, Paul VI wanted the Italian privileged relationship model to be projected beyond the National border – the Italian privileged relationship understood not as that of groups of interests that acted here and there around the Vatican borders, but one that had resulted in the fact that Italy was an exception in how it had successfully resisted the pressure of secularizing trends. After the very short pontificate of John Paul I, John Paul II followed. The scenario definitely changed. John Paul II wanted a Church with a strong presence in society, able to be the lifeblood of society. It was not just opening a dialogue with the world. It was rather being relevant in the world, and taking the leading role for human renewal, as the Church in Poland had done there. The ‘earthquake’ that followed this vision marked a change of the roadmap for the presence of laity in public life in Italy. Committed to the institutions they had themselves inspired (the Italian Constitution is based on the Camaldoli Code, drafted by a group from the FUCI in 1944), Catholics in politics in Italy maintained a very timid dialogue with the institutions they were part of. John Paul II asked for more relevance, and the Pope’s appeal was welcomed by the ecclesiastical movements, the true novelty of the Second Vatican Council. The most famous and widespread movements (the Focolari Movement, Communion and Liberation) were born in Italy, and there they established a base for Catholics committed to society. These movements took over the organization of the new presence of Catholics in public life. They led the debates which had been at the core of the Italian public discourse until now. In particular, Communion and Liberation took over the role of enhancing the presence of Catholics in the country and to serve as a cultural guide, bringing forward debates of magnitude on issues like religious freedom, bioethics, and subsidiarity. Nowadays, a different roadmap seems more appropriate. An internal dialogue within Communion and Liberation itself points in this direction. Julian Carrón, the successor of CL’s founder Father Luigi Giussani, stressed in a document ahead of elections to the European parliament that there is a need to return to the essentials, the announcement of the Gospel, before forming groups of positive pressure. In the document, Carrón drew heavily from Benedict XVI, and carried on the discussion referring to Pope Francis’ Evangelii Gaudium. Carrón’s words dwelled into the spirit of Father Giussani. Promoter of a Christianity imbuing every aspect of life, Father Giussani periodically reminded his followers not to make of «structure, organization, principles» more than of the main goal of being Christian, the announcement of the Gospel. This is the reason why Father Giussani never gave CL the contours of an association. And this is the reason why he chose Julian Carrón as his successor. Carrón is a Spaniard who formed a movement before knowing Communion and Liberation. Once he met Father Giussani, Carrón joined CL with his movement. The same path had been followed by the founders of the Brazilian movement Trabalhadores sem Tierra, who are now responsible for CL in Brazil. The movement’s outward-looking strategy was also manifested in the choice for president of the Compagnia delle Opere (CDO), the CL’s economic-financial branch. Lawmakers linked to CDO have recently been involved in several business scandals in Italy, since they are tied hand in glove to a certain financial-political milieu. The president is now Bernhard Scholz, a German who is completely out of this kind of logic, who is moving the CDO to a brand new world, outside of the Italian mind-frame. Carrón’s words triggered a profound self-reflection within Communion and Liberation. There were those, like the philosopher Massimo Borghesi, who noted that many cultural struggles had become more an expression of a sort of Christian lobby than part of the evangelization. And those who, like the journalist Antonio Socci –who took part with conviction in those battles – underlined the importance of that way of taking part in the public discourse. Even standing in opposition or making alliances with the secular world without the intention of evangelizing it. This discussion certainly goes beyond Communion and Liberation and – on a smaller scale – is replicated in the Catholic Church. After John Paul II, Benedict XVI carried on this outward-looking strategy. He spoke of a «non moralist Church » and of the primacy of evangelization in several occasions, the most bold ones were the off-the-cuff speech to Swiss bishops in 2006 and the speech held in Freiburg during his 2011 trip to Germany. Benedict XVI placed the roots of faith in truth, speaking about God and freeing the Church of any kind of political constraints; and he gave the Holy See an international mentality, also on a juridical level on which every structure is based: the reform of Vatican finances, the reform of the Vatican penal code, the way of managing diplomacy, are part of Benedict XVI’s legacy. And Benedict XVI was constantly under attack because he was not bound to the old logic. John Paul II’s huge effort decreased in the last years, when he was sick and tired. Then, the curiali, led by the then Secretary of State Angelo Sodano, made new ties with the Italian world, backed by a certain type of provincial thinking, benefitting from John Paul II’s popularity. In the last period of John Paul II’s pontificate, the Church had become the reign of the curia’s “pope-chaps” rather than a fountain of cultural dialogue. The members of the Curia of the old days pushed for a new image of the Papacy in the last conclave. A more popular papacy, in order to mitigate the damage to that image, that they themselves had infringed during Benedict XVI’s pontificate. Pope Francis met their needs. An outward-looking Pope, that would allow the Curia to be rebuilt according to the old schemes. And Pope Francis ultimately appointed the men of the Curia of the old days to many key posts, and praised the “old Curiale”. At the same time, Pope Francis does not love the old ‘Italian fix’, and perhaps his future choices will be a surprise for those who were hoping a return of the old days. Putting aside any diplomatic reverence, Pope Francis instinctively goes beyond the old schemes of the Curia. Although the informal Papacy may present some limits, it is also true that Pope Francis may also contribute to strengthen the international profile of the Catholic Church. He designed the profile of the outward-looking Church. How it may be shaped for what concerns its governance is yet to be determined. The Pope will need very good consultants. One of them, a hidden one, may be Benedict XVI. Looking at the discussion about reforms and listening to rumors on his next moves, it is conceivable that Pope Francis’ next choices will be to further the goal of giving the Church an ever more international character. This Italian political stuff is just foreign to me. The beatification of former popes (John XXII and John-Paul II) by the present pope (Francis I) is the sign of an inward-looking church.